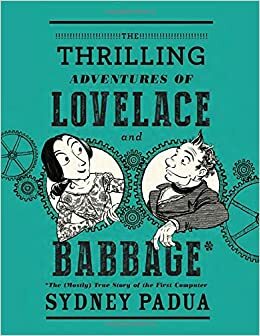 Pretty much as soon as I heard about Sydney Padua's graphic novel The Thrilling Adventures of Lovelace and Babbage, I wanted to read it. A graphic novel set in some sort of alternate universe in which Ada Lovelace grows old and uses computers to solve crimes with her genius-but-awkward partner, Charles Babbage? Yes, please! I was a little overwhelmed by this book at the beginning. There are a LOT of footnotes, basically at the rate of one per sentence. Most of them are related to mathematical theories, historical writing, obscure (to me) Victorians, etc. I admit I didn't read all of the footnotes (mostly because, in addition to footnotes, there are also extensive endnotes), so it's possible I missed some key action points in the book. But honestly, I didn't really care. This book was fun, regardless. I love the idea of just turning Victorian society on its head and showing us that maybe some of them had well-developed senses of humor and mischievous smiles and poorly-timed snorts of derision. I always imagine Victorians as either completely buttoned up or letting loose in bizarre ways, and I liked how Padua made the Victorians much more vivid and real and relatable. And at the center, of course, are Ada Lovelace and Charles Babbage. (And, to a lesser extent, Queen Victoria.) Partly because of the sense of motion and vigor in the artwork, partly because of Padua's great sense of fun, and partly because Ada Lovelace and Charles Babbage were just amazingly larger-than-life characters, they really made the stories come alive. But it's not all fun and games. Well, it is. But it's also science and math and economics and probability and so much more. Basically, these stories are based on the premise that Lovelace and Babbage design and refine a very complex machine (the Difference Engine) that Queen Victoria would like to use to solve ALL THE PROBLEMS. And they make many reasonable (and unreasonable) attempts to do so, or solve more mundane matters, even including a fantastic cameo by George Eliot. But generally, they don't really make great progress. But again, who cares? It's so fun. I really enjoyed everything about this book, and I learned a lot of fun history and science along the way. It is so entertaining and just so fun to read; I highly recommend it to anyone with even a modicum of interest in Ada Lovelace, computers, technology, Victorian England, pocket universes, or anything else. I enjoyed this one too, but I think I would have loved more adventures and fewer footnotes! I was initially thinking of this as being like Nimona in terms of whimsicality -- but I think I need to recalibrate to thinking of it as a fun way to learn science history. Which is also good! Oh, this sounds like something I would like!